You deserve a glamorous kitchen. Never settle for anything less than a natural stone or quartz custom countertop. The enduring beauty and reliability of natural stone and quartz is unmatched. We provide an endless array of granite, quartz, onyx, and marble, all fabricated to create the most elegant kitchens. You only need to make one stop to find unlimited options for custom countertops in Reno, Nevada. We carry the most trusted brands in the market today, showcasing countertops in robust, compact materials, exotic grains, bold and subtle hues, and rich textures. There is an option for nearly every type of kitchen or bathroom design imaginable. Quick turnaround time – Have your countertop delivered to your house in as little as two weeks. In just a matter of hours, you’ll have your craftsman kitchen or luxurious bathroom vanity set up. 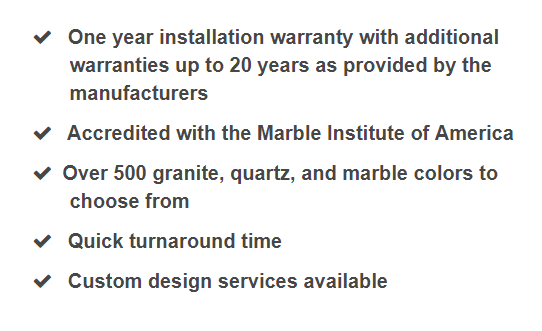 Accredited by the Marble Institute of America – Our accreditation ensures that you are getting the best natural stone products in the market. We partner with top-of-the-line fabricators to bring you lifetime warranties and products that are built to last. Expert design services – A visit to our showroom means you won’t go wrong with your choice of countertop, as one of our designers will assist you all the way. Custom-made for your project – We are licensed to customize and install all types of countertops for your kitchen or bathroom remodel, even laminate and solid surfaces. Natural stone takes the top spot in every high-end, craftsman kitchen, and for good reason. Its natural beauty complements traditional, contemporary, and eclectic kitchen and bathroom designs. It has character, owing to each slab’s unique grains and hues, but its beauty also stands the test of time. Its durability and low-maintenance quality make it the preferred choice for the discerning homeowner who spends time in the kitchen, from homemakers to trained chefs. While not a natural material, quartz can also match up to these qualities, making it a great choice for your kitchen project. The kitchen is the heartbeat of every home. Let Accent Custom Countertops help you build one that reflects your unique personality and refined lifestyle. Visit our showroom and find the largest collection of luxury countertops in Nevada. Call us to schedule an appointment with one of our designers.